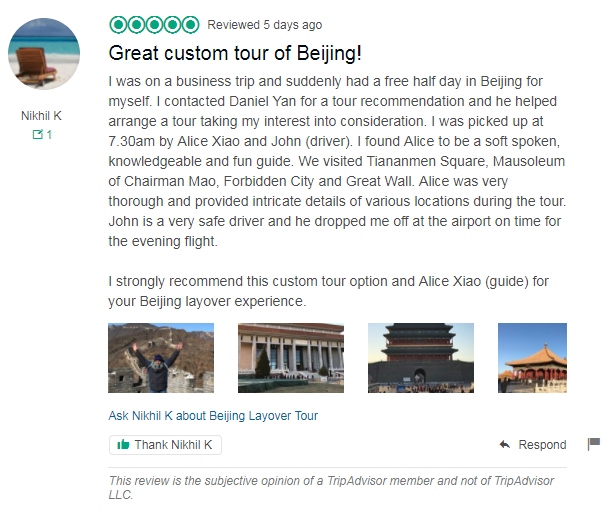 Tour Description: Beijing airport pick-up by our private guide & private driver; the guide will hold a sign with your name on at arrival hall meeting point. Drive to visit the majestic Badaling Great Wall first. Badaling is the most popular section of Great Wall and has received many celebrities and state leaders. Stay at the wall as long as you can. 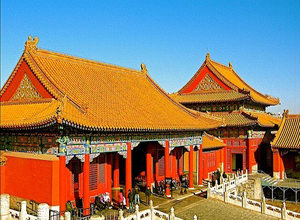 Transfer to city center to visit the Tiananmen Square and Forbidden City imperial palace. Be escorted back to airport after the tour. End of our service. Sorry! The Forbidden City is closed on Mondays. We recommend you visit the Great Wall, Tiananmen Square, Jingshan Park and Temple of Heaven. You can see the panorama of the Forbidden City from Jingshan Park. We just sent you an email about the tour details, please check. Thank you! I fly in to Beijing on September 2 @ 10:50am (CA 180) and depart @ 10:35pm (CA 989). We would like to visit the Forbidden City and eat at one of the best restaurants that serve peking duck in Beijing. What would be the cost of a private tour for the above? We are 2 adults, my father and me. My father can not do long walks. Do you offer wheel chair assistance? Yes, we can take you to visit the Forbidden City and have Peking duck. And we will provide a wheel chair for you. We just sent you an email about detailed tour itinerary with the timeline, please check. Will this trip be possible? And how much? Yes, according to your layover time, you can visit the Mutianyu Great Wall, Tiananmen Square and Forbidden City. Hi there, I would really like to see the Great Wall at sunrise. I arrive at 5:10 pm on Monday 27 November and depart Tuesday at 3:10 pm. Do you think a tour could be available? Sorry, I do not think you will have time to see the Great Wall at sunrise. Since the Great Wall opens at 7:30am. So our earliest pick-up time is 6:30am. We have sent you an email about tour details, please check. We arrive in Beijing at 4:00 am on December 31st and leave at 11:50 pm. Will we have enough time for the Great Wall and Forbidden City private tour? Also can we add a stop to the Silk Market with this tour if we pay extra? Yes, you will have enough time to do the tour. If you would like to visit the Silk Market, you would have to pay extra fees. We have sent you an email about detailed tour itinerary and price, please check. Hi,I have a group of 4 people and we have a 15 hours long layover at PEK on 4.12. arrival at 0940am and departure 5.12. at 0105am. What will be the best tour to us and how much is it? Thank You! According to your layover time and date, We recommend you visit the Great Wall and Summer Palace. Since the Forbidden City is closed on Monday. Please provide us your arriving & departing flights times and your tour date, then we will know which tour is suitable for you. hi there, I’ll be at Beijing Airport tomorrow at 10 am and will be flying the next day at 1 am, is the time too short for Badaling and Forbidden City? Sorry, it is too late to arrange the tour. We have no tour guide available for tomorrow. ok,thank you for your fast reply!